When you think about foods you love and then think ‘ I’m not allowed that anymore’ it can have such a negative impact on the way we feel about healthy food. With that in mind, I’d love you to try this delicious recipe. All you need is the ingredients, a long vessel (glass is wonderful, for the visual alone (! ), a long spoon (you’re going to need to dig deep to enjoy all of the surprises in this treat) and a hungry tum! Spoon a layer of orange muesli into the bottom of your Sundae glass. Lay a generous hepig of coconut kefir cream on top of the muesli. Next, carefully pile in some more muesli. If you place it gently, it will sit nicely on top of the cream! Take some coconut kefir cream and mix it with a protein powder of your choice. You could add honey/rice syrup here, if you need it. Or, blend some soft dates with a little water/coconut oil (to create a paste) and stir together. Blend some fresh or well strained fermented, brightly coloured berries (it could be any berries, but red or pink makes the Sundae ever so inviting!) in a blender, then gently stir in – by hand – some coconut kefir cream. Stir in a few blueberries to the red/pink berry kefir cream and create you next layer. 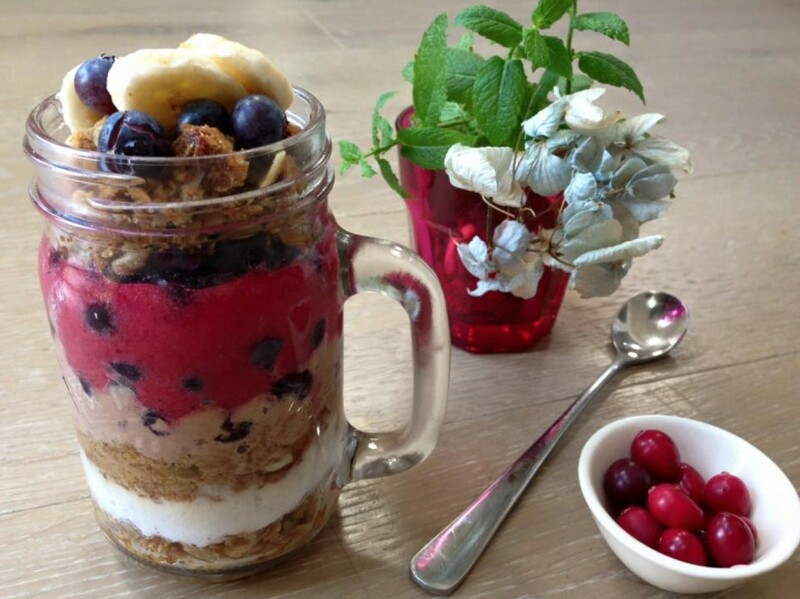 Finally, gently add your top layer of uesli and decorate your beautiful meal with blueberries and slices of banana. Grab yourself a long spoon, give yourself time to enjoy your treat and … well .. dig in! I hope you enjoy this. It’s soooo decadent and full of good protein, mainly low sugar fruit (aside from a little banana) and probiotic goodness. That looks so good!!! I love most fermented foods, but kefir is by far my favorite. I’m definitely going to try this, yum. These look really delicious Sarah, do you do all the photography yourself as well? Thank you Garth! I do, yes. I’ve also bought into an online smartphone photography course, so I can learn more about the technical side of taking food photographs. I find photography fascinating!